The incessant rain was no deterrent to sports enthusiasts who gathered at Rustom Baug, Byculla, on Sunday to witness a football match with a difference. As the crowd cheered on, 14 teams from all over Mumbai’s Parsi colonies participated in a novel event that required them to play football on scooters. The winning team, Cyrus 5, took home the first All Parsi Football on Kinetic Scooter Cup along with a cash prize of Rs10,000. 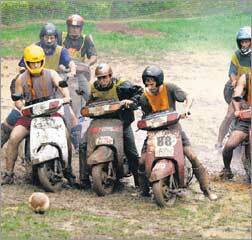 Each team had five players who chased the football on their two-wheelers and used their feet to kick it. The participants, including the goalkeeper, however could not use their hands. “The idea was to merge two of the best-loved sports–football and motorcycling,” said organiser Rustom Patel, a professional biker and national motorcycling champion. A brainchild of Rustom’s father Kersi Patel, 61, each match lasted 20 minutes with a half-time. “We decided to use scooters since they are not only light and manageable, but the gears and brakes are on the handle, leaving the rider’s legs free for kicking the ball around,” he added. One of the biggest concerns during the match was the possibility of accidents due to the heavy rains. However, all worked out well for the organisers as well as the participants. “In fact, the rains helped in dissuading the riders from speeding. Though we had a few participants falling off their scooters, no one was hurt,” Rustom said. Overwhelmed by the response to their novel idea, the Patels plan to hold the football-on-scooters match every three months. Meanwhile, Rustom is also excited about his trip to Spain with another bike enthusiast actor John Abraham. “I am the winner of the Castrol Power1 Throttle Max Champions 2006, which was held last month in Jaipur. Since John is Castrol’s brand ambassador, my prize includes a trip with him to the Valencia Moto GP to be held in Spain in October,” Rustom said. The Taepodong StrikesBombay Rude? Hard to Digest !